Whether you’re planning a special event, or have something in mind for May 12th, this useful pack will help you spread M.E. awareness. 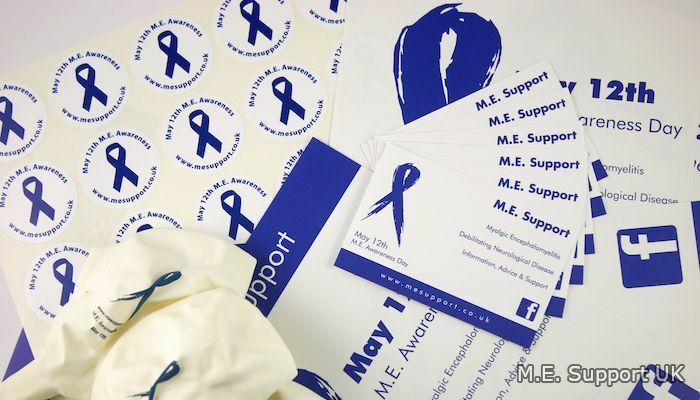 It is great teamed with some Awareness Ribbons or Pin Badges. You will receive a two dozen A5 leaflets and ‘business' cards (sold at cost), a sheet of thirty-five Lapel Stickers, and ten printed Balloons. This pack is priced at £8.20, although larger packs are available upon request; please Contact Me for a quote. If you would like to place an order from outside of the UK, please Contact Me for an international delivery quote.